Don�t get tangled up in your rocker lifestyle. De-stress, detangle and defrizz your over partied locks and keep hair lookin� freaking awesome. Rock On! 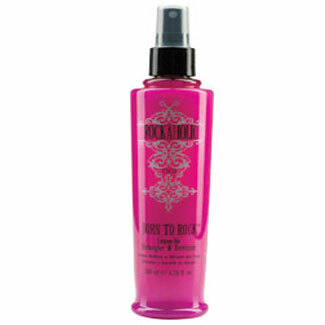 You can spray it in to reactivate styling products in your hair to rework your look when on-the-go. Helps to balance hair�s texture so styling aids go on more evenly and work better. Helps to prevent heat styling �hang-over� (you know � that sick feeling you get from breakage and frizz) by adding a thermal barrier to hair.